I swear by all that's holy, I'll come back. I'll come back and take this grenade and shove it down your throat and pull the pin! —Lt. Joe Costa, Fox Co. Author Pat Kirkham discusses the opening titles for Attack, from her authoritative book Saul Bass: A Life in Film and Design. 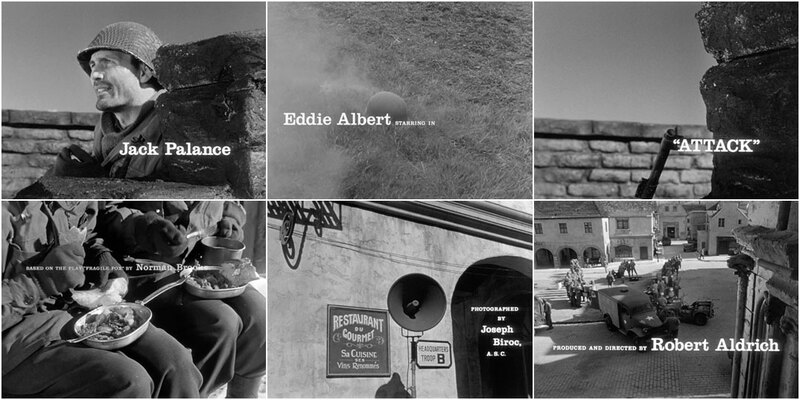 For this title sequence, Saul created a montage of off-duty soldiers relaxing in a near-deserted Belgian village during World War II. It cuts in after a dramatic live-action opening in which sixteen men are slaughtered. The segue to the titles features the helmet of a dead soldier rolling down a hill. It stops at a spot where a solitary daffodil grows and fades neatly into the circular mouth of a loudspeaker broadcasting swing music. 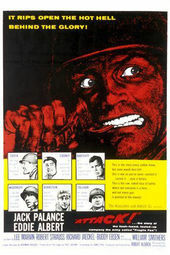 The release of Attack was announced in the Hollywood Reporter in an unprecedented ten-page advertisement designed by Saul, which itself reads as a moving sequence. 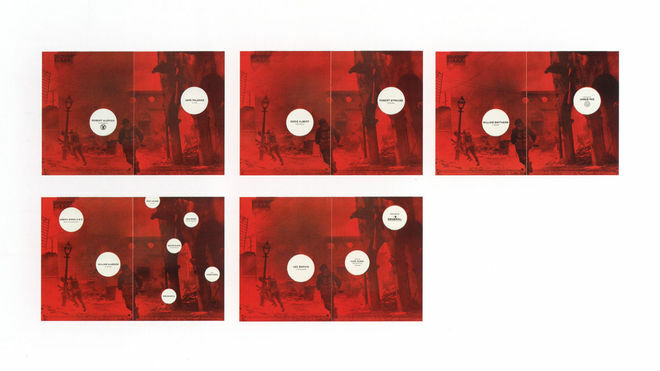 Each double-page spread features the same blood-red still with men in combat gear moving across the frame, while the credits unfold in clear type within bullet-like white circles.